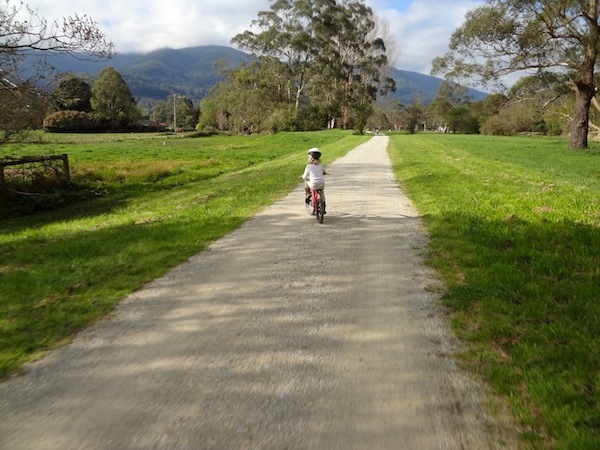 The Lilydale to Warburton rail trail is something special. Firstly, it is not far out of the city - you can get there in an hour with the regular commuter train and don't have to worry about timing trains. Secondly, it is easy with many opportunities to eat, sleep and relax on the way. And thirdly, it is absolutely stunning. The ride is around 40km long. However, it has many access points, giving you the opportunity to ride or walk only sections of it. The surface is fine compact gravel and suitable for touring bikes. You find people walking their dogs, kids, horse riding and the casual as well as the more serious bike riders on the way. 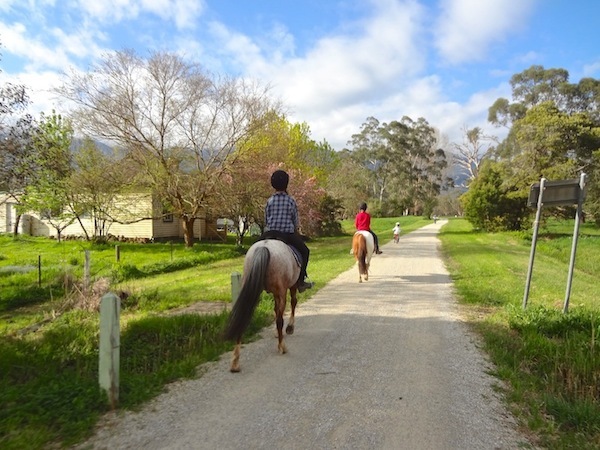 We like riding the trail in a day, staying overnight stay in Warburton, and back the next - which makes it an active, but not too exhausting family weekend away. 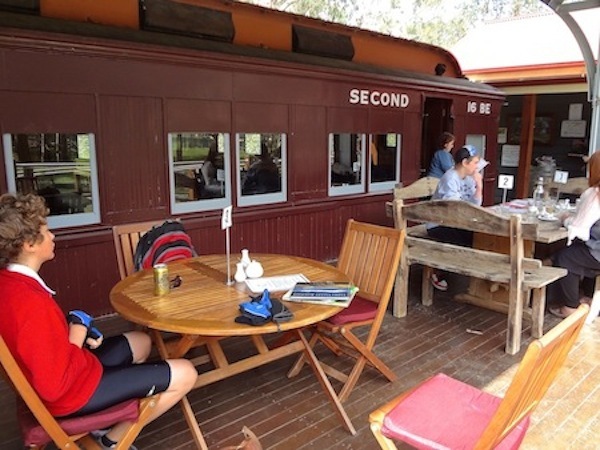 If you are keen you can easily do the return trip in one day, with lunch in Warburton. 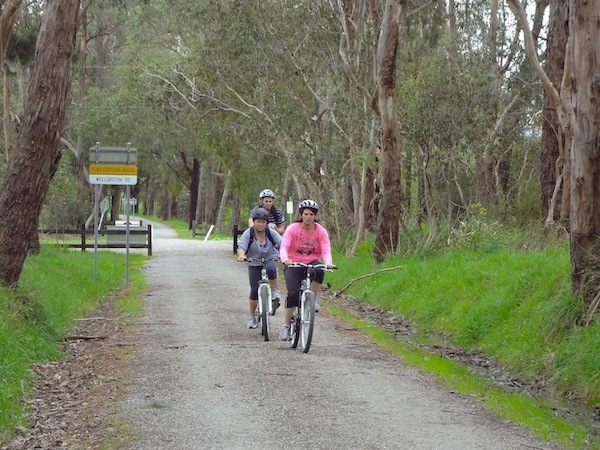 As with any rail trail the grades are easy. The only real rise is up to Mount Evelyn, the first stop out of Lilydale, which really it is not more than a stretched out hill - 127m in height difference! Yet the climb can feel long, especially from the other side on the way back, where it stretches a bit longer. Nevertheless, it is doable with kids from about 10 years old. 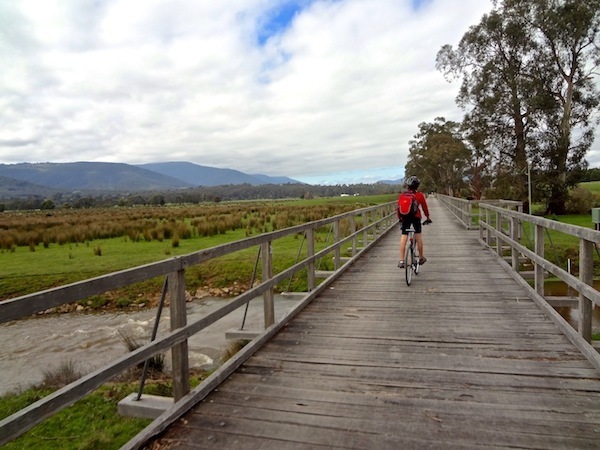 The rest of the ride is almost flat following the ancient floodplains of the Yarra. 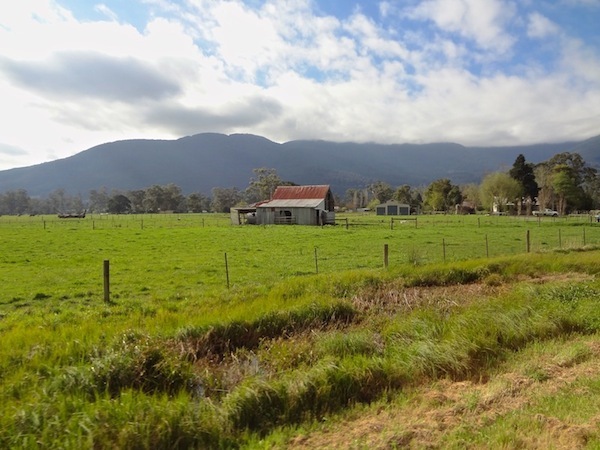 The scenery through the valley is stunning, with rolling farmland, vineyards, sleepy cows, ducks, billabongs, fern tree gullies, old railway platforms, wooden bridges, rusty sheds, wildflowers, birds and bushland - all in front of the backdrop of the Yarra ranges. While out of the city, it is pretty civilized with a number of coffee shops, bike repair places and towns on the way. You can get away with carrying only a bottle of water, which can fill again at the next pit stop. It is well sign posted. We have done it in summer and spring, which were both pleasant, albeit one of the summer's days a bit too hot for our liking. Winters can get cold in Warburton, but nothing a pair of gloves could not handle. 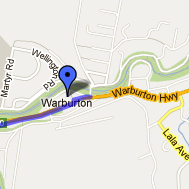 Here is a Google map of the Lilydale Warburton Rail Trail. 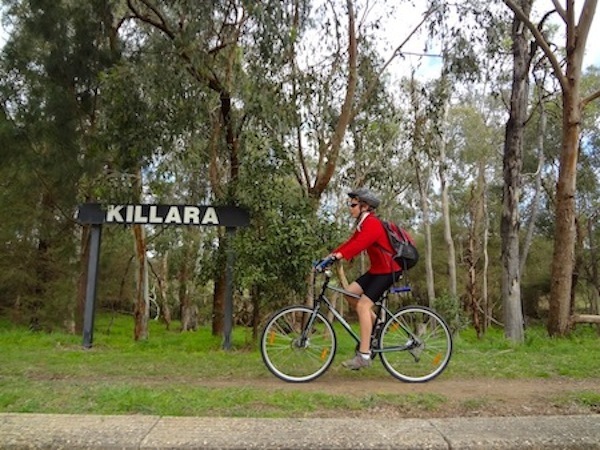 Lilydale to Mt Evelyn (7km) - Lilydale is located at the end of the train line. 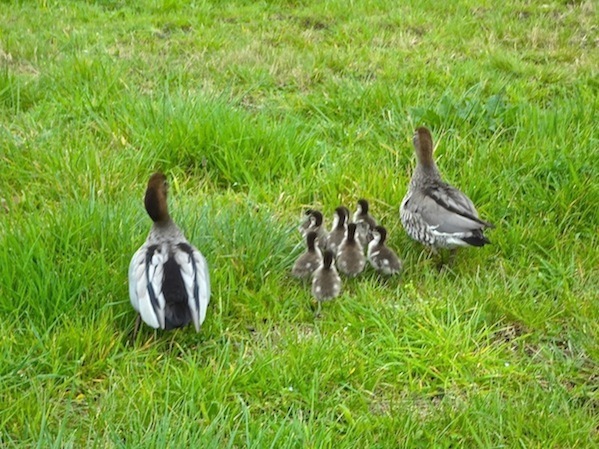 From there make your way to Queen Road at the eastern end of Lilydale. Where a foot/bike bridge will help you crossing the busy Maroondah highway. This is the start of the rail trail. From there follow the signs up to the small town of Mt Evelyn (not the actual mountain). 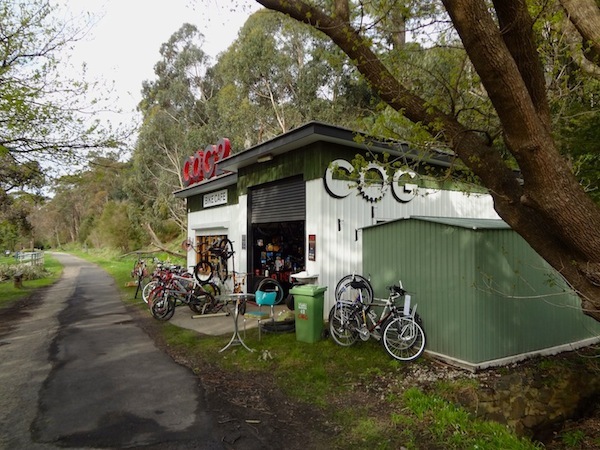 Mt Evelyn to Wandin (5km) - there is Cogs caf and bike service on the way. However we have not seen it open yet, so I would not count on it. This section trails through shady bushland. 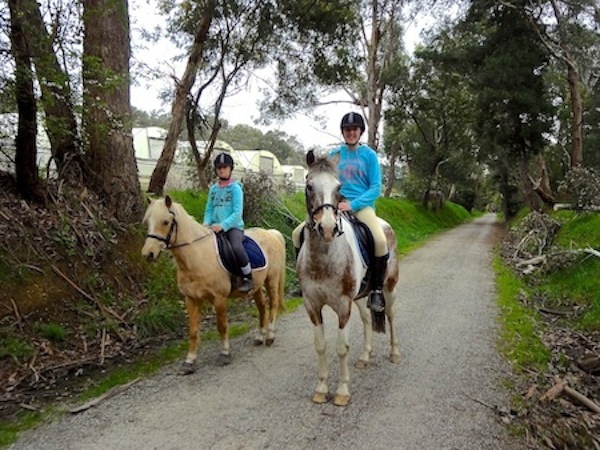 Wandin to Seville (4km) - downhill! In Seville you find the Carriage caf, which we haven't been able to resist yet. From there you are riding along the actual valley. 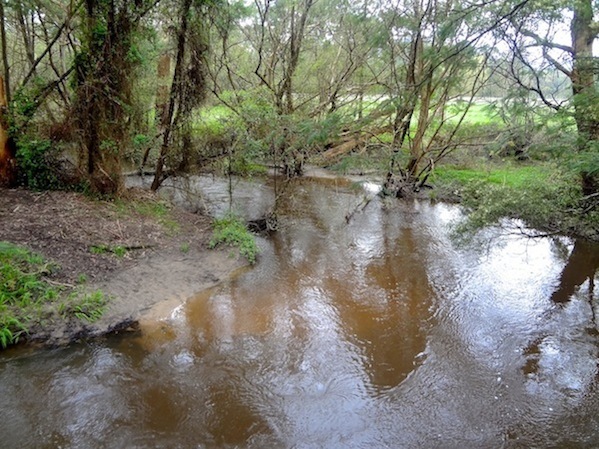 Seville to Woori Yallock (7km) - Woori Yallock is the lowest point of the track, with lots of floodplains and cows. It is also around the mid point, which is where we get hungry. It is also well known for the Woori pub. 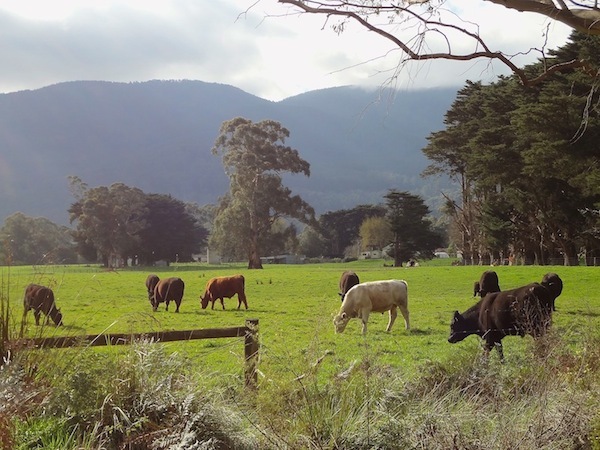 Woori Yallock via Launching Place to Yarra Junction (8km) - Launching place is your highway pitstop at the authentic 1900s Home Hotel. After that the path follows a couple of kilometers along the highway, the least pleasant stretch. 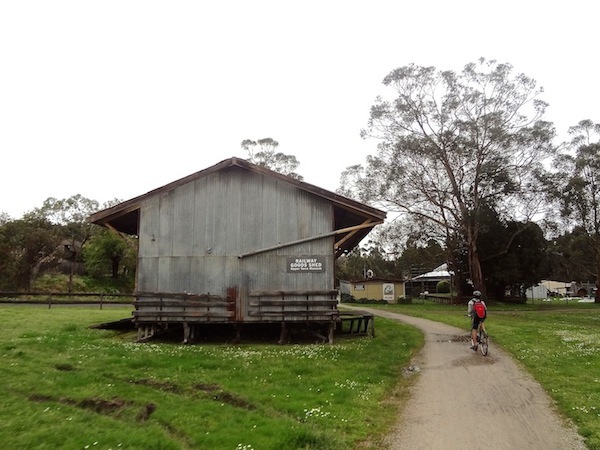 Yarra Junction features a museum with old farm and train equipment along the path - and a large supermarket if you need to stack up. 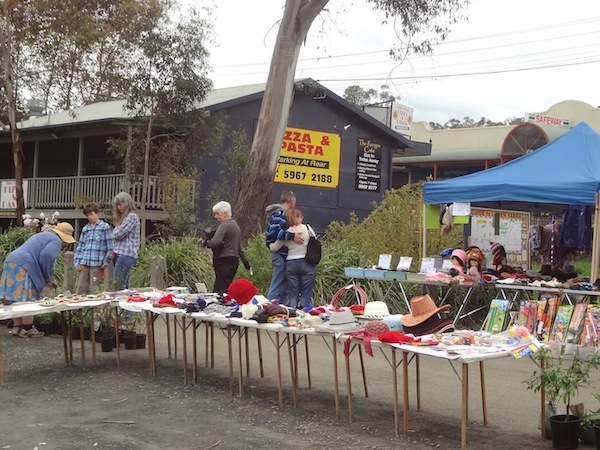 You also trail past a very small market with a random selection of wares on Sundays, where we have not yet failed to find some unexpected bargain. 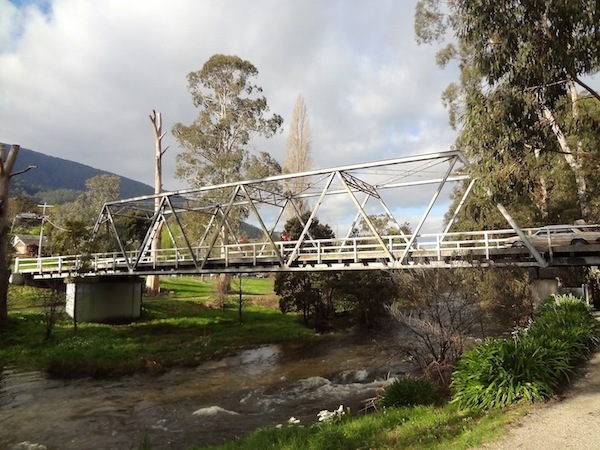 Yarra Junction via Milgrove to Warburton (9km) - through one of the most scenic bushland and winding creeks, the hills of the valley are beginning to close in on you. 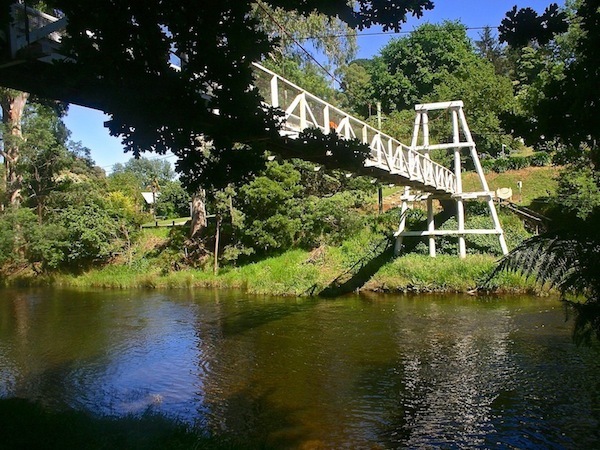 You emerge at Milgrove with its original still operating sawmill. On from there you get glimpses of the Yarra raging through the deep valley below. 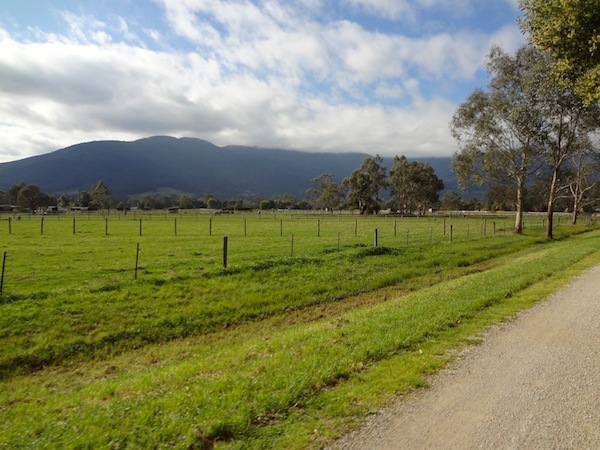 And then Warburton, I reckon the most attractive town in the Yarra valley. 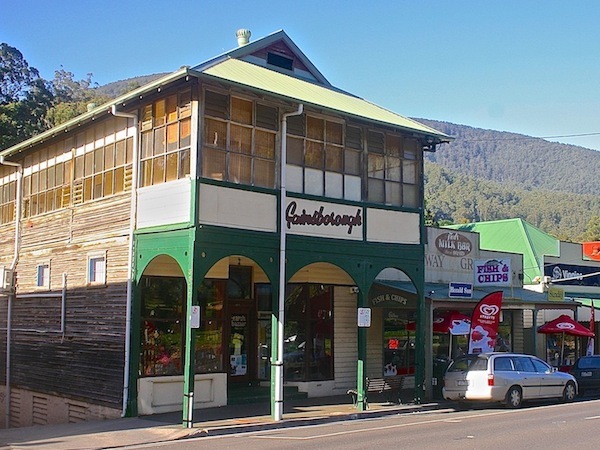 Warburton is geared towards the weekend tourist with numerous restaurants, coffee shops, clothes and gift shops. Definitely not cheap, but distinctly alternative and charming! 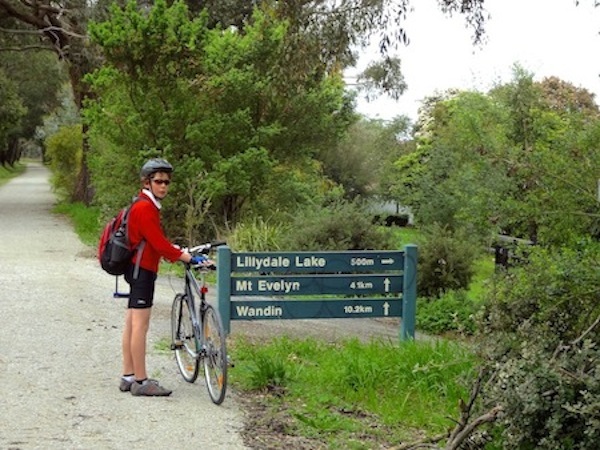 Enjoy our photo gallery of the Lilydale Warburton rail trail.